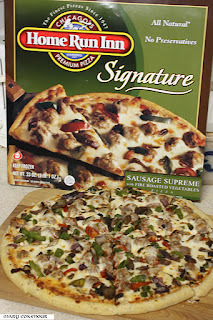 Food Adventures of a Comfort Cook: Home Run Inn's Frozen Pizza. Home Run Inn's Frozen Pizza. Home Run Inn is an actual pizza establishment in Illinois, so when they say real Chicago pizza, they mean it. The pizza business itself started in the 1940's and has expanded into 8 restaurants and the frozen food market. 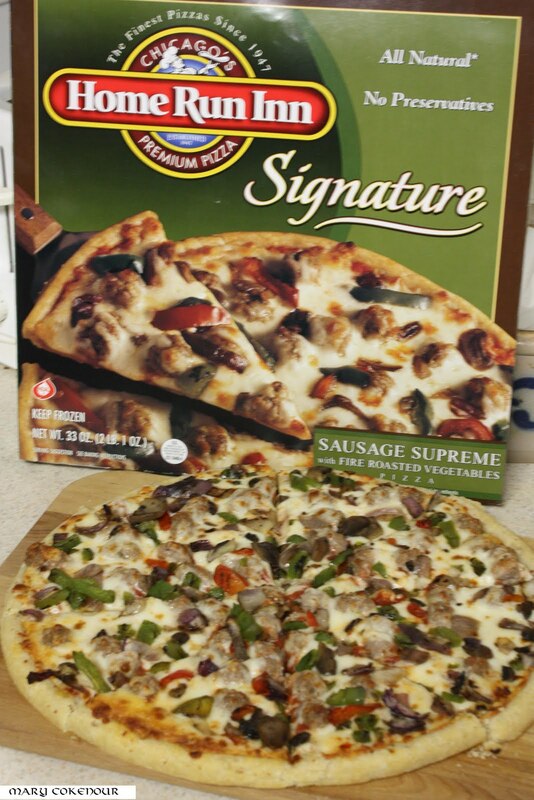 While shopping at City Market in Moab, Utah, I noticed a new display in the frozen pizza section; what really got my attention was the "Chicago's Premium Pizza" written on the box. I wondered if this was just an advertising ploy by another California chain, but no, the company is from Illinois. I purchased one of the cheese pizzas, went home and tried it out; the next day we went back and purchased a few more. Home Run Inn does NOT use preservatives; check the ingredient label and you'll find you do not need a degree in chemistry to read it. After baking in the oven, you can better see all the cheese, sauce and other toppings, depending on which type you purchased, and the taste is awesome. Our one big problem is the crust; we just can't seem to agree on it. Cheese pizza #1 - baked directly on rack in oven; the outer rim was very hard while the bottom was crispy, but it had an overall good taste. Cheese pizza #2 - baked on top of aluminum pizza pan that had air holes in it - the outer rim was now crispy while the bottom was not as crispy as the first pizza we made; however it was cooked all the way through. Sausage Deluxe - baked on top of aluminum pizza pan that had air holes in it - the outer rim was crispy while the bottom was not at all; it was very dense. Now I'm not going to fault the crust on Home Run Inn; the directions do say to bake directly on rack, but I used a pan to avoid getting an overdone crust, but ended up with somewhat or heavily underdone. Will I make Home Run Inn frozen pizza again? Most definitely, but I'm following their directions; as a frozen pizza, it is the closest to fresh baked than any other on the market. The sauce, cheese and toppings are outstanding!!! I just have to get that crust baked correctly, but that's on me. I cook it at 410 and then add several minutes. That way, it doesn't over-brown but has a chance to cook through. Don't be afraid to cook it until the cheese is browned, too. It's a Chicago thing. Cheers! Mary, Thanks for the kind words!! I have referenced this article on our Blog at http://www.homeruninnpizza.com/chicago-pizza-blog. also if you have not done so I recommend checking out our recipes section on the website http://www.homeruninnrecipes.com/ A lot of good information on ways to cook and personalize your pizza! From Magi - "Thank you for posting such a useful, impressive and a wicked article. Wow, looking good." Thank you for the comment Magi, however, I could not allow your link to be posted with the comment.